The glacial river Kudafljot in south Iceland has a large catchment area. Its main supplier is river Skafta, lake Langisjor’s discharge, which collects a great number of tributaries en route through the Laki Area. There it collects mainly spring fed rivers and brooks, which originally started as glacial streams from the edge of glacier Sidujokull. This muddy water disappears on the outwash plain and gets filtered before reappearing as icecold spring water. Farther down river larger tributaries, rivers Tungufljot, Holmsa, and the greater part of river Eldvatn, are added a short distance north of road #1. A larg branch of river Skafta continues east to Kirkjubaejarklaustur, where it starts spreading over the large outwash plains between the counties Alftaver and Medalland to the sea. Before the river was bridged, it was forded on horse back in spite of the lack of reliable fords. Every time a new ford had to be found. The river is partly deep and treacherous because of quicksand. The averate flow is 230 m3/sec and the maximum has been measured 2000 m3/sec. The minimum flow measured 110 m3/sec in the estuaries. Many travellers drowned attempting to ford this river as so many others in the country, because they did not know how to find the proper fords. Usually the river was forded where it is approximately four kilometres wide. The first bridge was built in 1993 and opened in 1994. Prior to that, the bridges of its main tributaries were used. According to The Book of Settlements, Vilbaldur set off from Ireland on his vessel Kudi. He arrived in the river’s estuaries and the river was named accordingly. The legend has it, that the estuaries were a bay at the time and on of the country’s trading posts was to be found on the island Kudaholmi, where artefacts have been unearthened. Seals are hunted in the estuaries and anglers catch sea trout there. 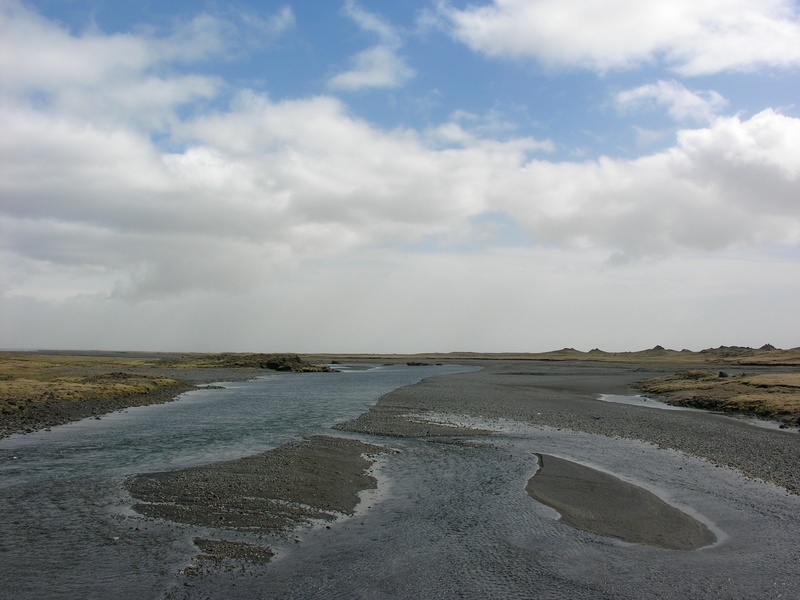 River Kudafljot is the product of confluences of several rivers discharging large areas in the Southern part of Iceland. The main river is Skafta discharging the glacial lake Langisjor and adding several spring fed streams in the Laki Area, originally glacial water from glacier tongue Sidujokull, which disappears into the permeable lava. Then it collects rivers Tungufljot, Holmsa and the largest part of Eldvotn, before it eventually gets the name Kudafljot a short distance to the north of the present bridge on road # 1 to spill into the sea on the south coast. A large branch of river Skafta continues to the east past hamlet Kirkjubaejarklaustur, where it spreads through the alluvial plains to the sea.